Fruitless Pursuits: Peter Molyneux's Curiosity Cube: We Now Know the Prize, but was it Meaningful? 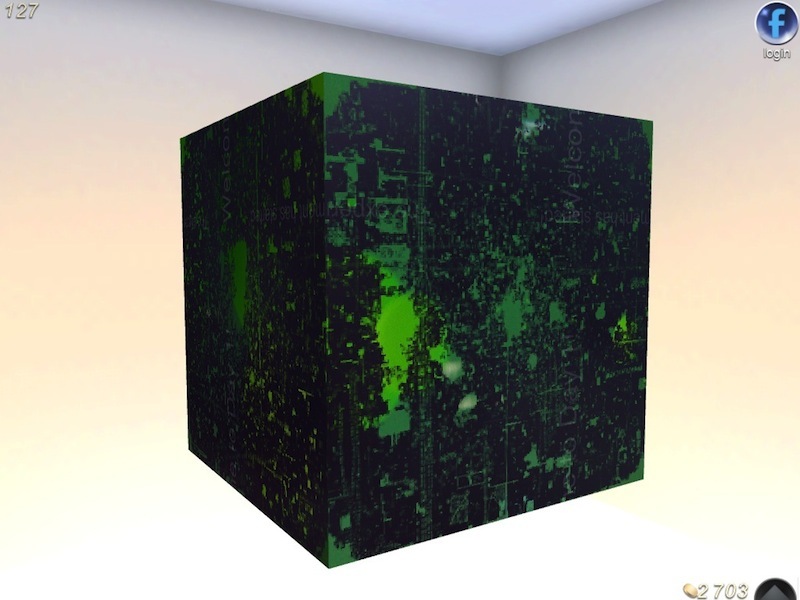 Peter Molyneux's Curiosity Cube: We Now Know the Prize, but was it Meaningful? If you’re completely lost at this stage, don’t worry. I’ll give you the rundown of what Curiosity was, plus the nature of its prize, and its ramifications... after the jump! Not so much a game as a “social experiment”, Curiosity: What’s Inside the Cube? presented IOS and Android users with a virtual cube made of billions of tiny blocks, dubbed “cubelets”. Players collectively tap away at the cubelets, stripping them away layer by layer in exchange for gold coins. The gold coins could be used to purchase in-game novelty items that made the cubelets faster to eliminate (or, late in the game, even restore to the cube). Some people chipped away as fast as humanly possible and others took their time to strategically create pictures or leave messages (usually offensive). Mind-numbing ambient sounds played in the background. And that was pretty much it. Tap tap tap tap tap tap tap tap. Tap tap tap tap tap. Tap. I will say that it was incredibly therapeutic. I was personally prone to taking out a few blocks on my phone while waiting for something, or on my lunch break. I listen to podcasts constantly so my mind was already occupied and it gave me something non-controversial to do with my hands. We play so many simple games on our phones that require repetitive actions anyway, and it was kind of nice to have something which was 100% stress free and that you couldn’t lose. And, for a while there, it also seemed like it was never going to end. It was satisfying enough for me to just watch my coins accumulate. Now that’s it’s finished I even kind of miss it. But let’s not get too misty-eyed about the cube. Because this was far from an altruistic exercise. Each update provided more attempts to grab at your real world cash by purchasing new items/toys in the in-game store. (These weren’t necessarily micro-transactions either. The diamond chisel cost $77,000). And soon after Curiosity’s launch, Molyneux and his 22 Cans team began an aggressively marketed campaign for their upcoming project, Godus, and quickly advertisements for this were integrated into the cube, in the form of banners, links, and photographs of supporters. Judging by 22 Cans’ pitch and development videos, Godus is another highly networked game where players take the role of a “god”, terraform the land beneath them and amass tiny “followers” who build mighty empires in their name. This all happens alongside other people’s creations and you battle it out. Or work together? It’s not yet all entirely clear. As always Molyneux has a lot of big ideas, but time will tell how many of them come to fruition. Why is this all relevant? An hour after installing the game one Bryan Henderson of Edinburgh, Scotland managed to successfully destroy the final cube and win the prize. 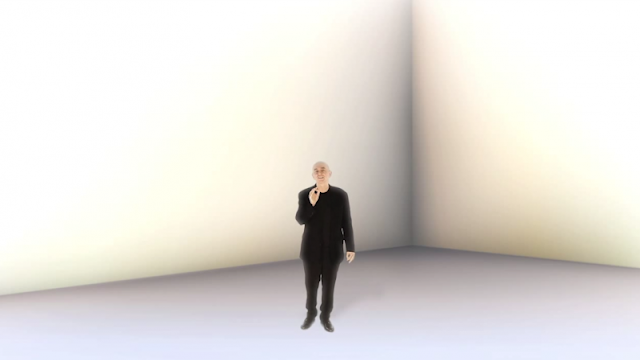 It was revealed via a video link in which Molyneux himself was superimposed inside the cube to justify exactly what was so “meaningful” and “life-changing” that he had to offer. Bryan Henderson will become the chief god in Godus and make decisions that will govern how the game operates. He will also have a share in the profits, earning a “small” piece of the pie any time someone in the game spends money. So what on earth does this all mean? To be honest, not much at this point, but it’s interesting to speculate. My own initial reaction was one of cynicism. This was obviously all a big publicity stunt to further advertise Godus and I expected the Internet to do what it does best and lash out at Molyneux with reckless abandon. While that has still happened to an extent, I am surprised at how much opinion on the prize is actually split. It appears that the notion of becoming a virtual god to (potentially) millions has captured the imagination of many an observer. And the imagined fortune that accompanies it has helped as well. I even find myself thinking... is this actually a very cool prize? The whole contest always had a bit of a Willy Wonka vibe, and Molyneux can certainly, at times, be as eccentric as that character. I also think he’s a very shrewd businessman, so while he couldn’t really handover the keys to his chocolate factory (an analogy, not a euphemism) he can give Bryan Henderson control of a VIRTUAL factory. And I think that’s precisely what’s he done. However, it’s impossible to identify the worth of such a prize at a point in time when it’s all still so nebulous. We don’t know if Godus will deliver on its promises, and we don’t know if people will be compelled to play it. Molyneux’s terms are also deliberately unclear: we don’t know how long Henderson’s “reign” will last, and we don’t know how small a percentage of profits that he’s actually going to net - and we probably won’t know for a while. Is it hundreds? Thousands? Millions? That in part will be determined by the players. And just how much control will Henderson actually have? Video games have a habit of promising that our actions will have consequences. The decisions we make throughout a game will influence the outcome. Molyneux has always been especially interested in this, even more so when it involves our moral choices. The catch, however, is that video games haven’t always been able to deliver on this promise, and in most games this all boils down to simple binary choices: raise taxes/lower taxes, build a school/build a weapons factory, pull the blue lever/pull the red lever, and the differences in actual game experience are usually cosmetic. Have you ever completed a game, believing that the ending was influenced by your choices, only to then play through a second time - choosing the opposite thing - and discovering that it’s all pretty much the same? I wouldn’t be surprised if Godus is challenged by similar problems. Obviously Bryan Henderson is unable to do anything that isn’t already programmed into the game. It’s probably also safe to assume that Our Lord Bryan (who only played Curiosity for an hour) won’t be availing himself to our prayers 24/7, in fact the possibility exists that he won’t have much time or interest in playing Godus at all. It’s perfectly possible that being “the ultimate god” consists of toggling options back and forth on a customized menu. This month: Exteme Weather: On. Hurricanes: On. Volcanoes: Off. Required Offerings: One virgin or three goats. Pull the red lever or pull the blue lever. Henderson can't even really enjoy the perverse satisfaction of continually trolling his faceless minions as he has a financial incentive to keep the game playable and fun. Or is that a human urge that's impossible to resist? But I do think that the idea of one person rising to the top of a virtual world in order to rule the rest is appealing and has a lot of potential. Upcoming MMO Dragon's Prophet appears to play with this to some degree by having instanced floating islands filled with player housing. Each of these instanced areas is ruled by a player who lives in a central castle and is they who set taxes and look after the general well being of those in their area and lead the fight against invaders. If they are not a good leader then their unhappy fellow players can attempt to overthrow them. I'm intrigued by the extra layer here, and I think it taps into aspects of human nature that perhaps other games don't. What, for example, would happen if the diminishing World of Warcraft shunted off all their NPC faction leaders (have them abducted into another dimension) and replace them all with democratically elected players. Let a player be the King of Stormwind and live it up in that castle. Let them choose their advisors. And it shouldn't have to be the person who as put in the most amount of hours, or even has the most in-game knowledge, but someone who can rule a large city, keep people happy, and make decisions that count. So I think, overall, it is an interesting experiment and could certainly be of value under the ideal set of circumstances. Whether Molyneux can pull it off or not remains to be seen, but even if he can't, perhaps it will inspire others?